As the result of a collective nomination process that took place this winter–involving Pixelache’s members, Expert Board, and a committee of people interested in Commons issues–two speakers have been confirmed to give an introduction to the theme of Camp Pixelache focused on the Commons in early June. 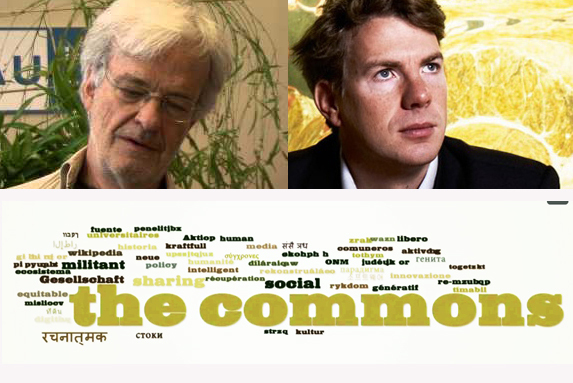 We have the pleasure to announce that Alain Ambrosi (Montreal, CA) and Markus Schmidt (Vienna, AT) will join our event and give keynote presentations in Helsinki on Friday afternoon 6.6 at 17.30, respectively on the Cultural/Knowledge Commons and on the Bio-Commons. The presentations will take place at Helsinki University, Unioninkatu 40, Auditorium 1. Alain Ambrosi’s presentation entitled ‘Let’s co-re-invent the Commons!’ will testify to the reinvention of the culture of the commons drawing on historical and intercultural perspectives, exemplifying it by opening up the process that led to the Remix the Commonsproject he initiated. Alain’s presentation also sets up our ambition to encourage local & regional artists, designers, researchers, activists and citiznes to share their voice and participate in video contributions about the Commons to the Remix the Commons platform and archive during the unconference part of Camp Pixelache (7-8.6). Designer and producer of intercultural projects, independant researcher, author and videographer, Alain Ambrosi is presently producer of the remix the commons project and associate researcher at Communautique. His long involvement in improbable international collaborations has led him to aspire to the status of utopian’s apprentice. In the case of Bio-commons, developments in biotechnology rely mainly on patents as means to enable and secure innovations. The new field of synthetic biology, however, entails not only classical intellectual property protection but also attempts to establish open access and open source to key biotech methods and processes. How will the two cultures evolve? Will one approach dominate or will they coexist? Markus Schmidt will walk us through the theme of the Bio-Commons, presenting various initiatives aiming at creating a more open source environment in the biotech area, the Nagoya Protocol as a means to internationally regulate the use and conservation of genetic resources. He draws parallels from the printer movement to biotechnology, with DIYBio spearheading the movement to go beyond the producer-consumer divide. Dr. Markus Schmidt is founder and team leader of Biofaction, a research and science communication company in Vienna, Austria. With an educational background in electronic engineering, biology and environmental risk assessment he has carried out environmental risk assessment and safety and public perception studies in a number of science and technology fields such as GMcrops, gene therapy, nanotechnology, converging technologies, and synthetic biology. In addition to his scientific work, he has organized a Science Film Festival (Bio-fiction) and produced an art exhibition (synth-ethic, both 2011) to explore novel and creative ideas and interpretations on the future of biotechnology. The visit of Markus Schmidt is supported by the Austrian Embassy in Helsinki.